In this chapter we talk about the principle of contrast and how this works with your dental membership program to increase case acceptence. We learned, in the Basics section in chapter 3 that member patients spend between 104% to 240% more or 2X to 3.4X more than non members (Mic Drop). This is a no brainer!! This data tells us that membership patients are more valuable. You would be crazy to not create a dental membership program. In this video we will be discussing how a membership program acts as a case acceptance tool for your practice. When done right this will help increase your recurring revenue and revenue from your treatment. Let’s talk about the principle of contrast from the book “Influence” by Robert Cialdini. I highly recommend reading this book as it will help you and your team understand how to increase case acceptance and how to sell and market your services better! The contrast principle (or contrast effect) says that when you experience two similar things in succession, your perception of the second is influenced by the first. Let’s look at an example of the principle of contrast in the real world and then talk how we can apply this to dentistry. The other day I went to best buy to buy a new TV. I found the perfect TV for $1,000, but then I remembered that I have an Amazon Prime membership so while I was in BestBuy, I pulled out my Amazon app on my phone and found the same TV for cheaper plus I got free shipping, I have a small car so I couldn’t fit my TV in it anyway. 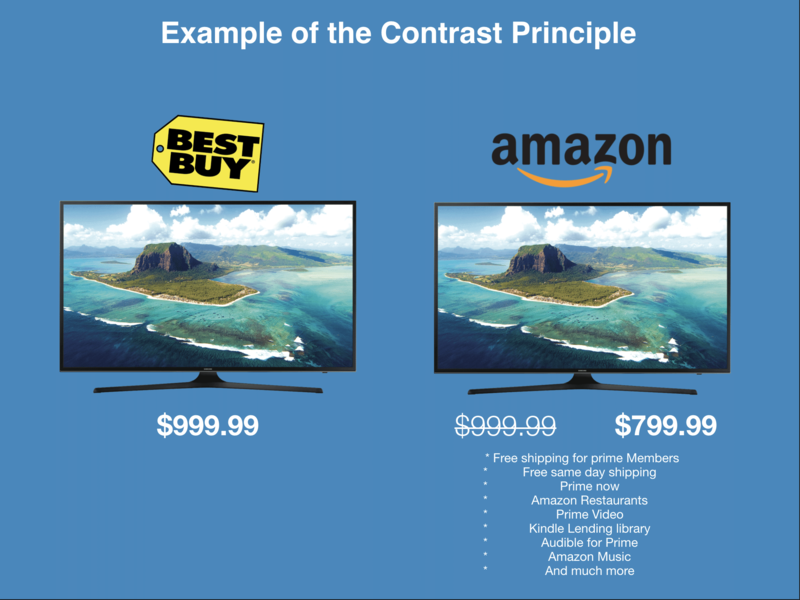 Amazon understands this principle and it works like clockwork. every time. John, I happy to help you get a new crown, this will help improve your smile and life. While you are uninsured the typical crown price is $1,000 dollars but since you are uninsured we have a dental membership program with you in mind, it is only $30/mo (insert your own monthly or yearly price), if you sign up today your crown will only be $800. How does that sound? This is a no brainer for the patient as well, they will say yes! You can also do this and compare the cost of dental insurance compared to your dental membership program and tell your patients all the benefits they get while educating them about the games and red tape of dental insurance, your membership program will look more affordable and will provide more value to your patients. When you offer a membership program, remember to use the principle of contrast so that you can sign up more members and increase case acceptance. This is exactly why members buy more because they feel like they get me value plus savings. This create a win-win environment for your practice and patients. Jordon Comstock is the founder and CEO for BoomCloud. He focuses on teaching dental practices about the importance of creating membership programs to generate recurring revenue, build patient loyalty, increase external marketing and increase case acceptance. Ready to get started with BoomCloud?